Few things are more overwhelming than moving into a new place and having a whole slew of cabinets to organize! Or doing a major clean up and having to organize cabinets all over again. Whatever the reason, let’s talk about how to organize cabinets today. Here are some professional tips to organize your cabinets and get the most out of the available space! 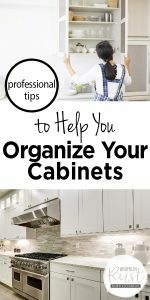 Organize cabinets by similar items. Think about how often you use the items. 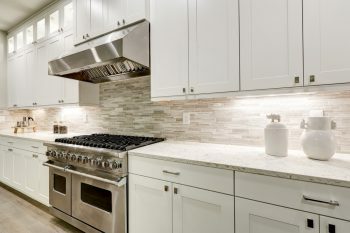 Store the most-used kitchen ware on the lower shelves, and the less-used items on upper shelves. That includes dishware and things you use only for special occasions. Store those on the very top shelf! Group all your kitchen items by similar purpose. 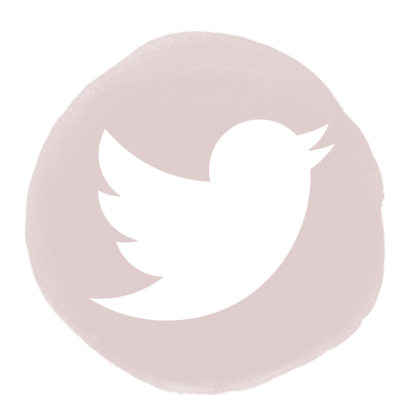 Devote bakeware to a baking cabinet, cookware to a cookware cabinet or shelf, etc. You get the idea! Shelf organizers are pretty great to organize cabinets and give you a little extra space where there wasn’t any. Check out the options at Amazon! 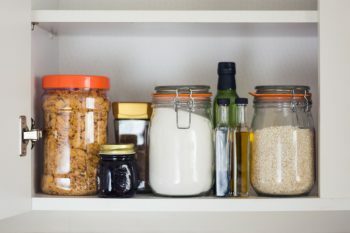 Store your food and pantry items by category, such as snacks, treats, baking goods, and spices. That makes it much easier to organize and find stuff when you need it. A lazy Susan is helpful for more than just spices–use it to organize cabinets in lots of ways. Condiments and small food items are more easily accessed when you can rotate them from front to back. See-through containers and labels are the only way to go. If you can’t store something in a see-through container, a label is the next best thing to cabinet organization. If you can, allocate cabinet space near the cooking zone for your cookbooks! They’re protected from spatters and grease when you aren’t using them. If you prefer, arrange them on open shelves away from your cooking area. 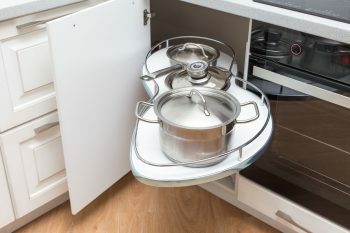 Figure out a way to contain all the lids for your cookware and containers. A bin just for lids will do the trick. Try these professional tips to organize cabinets. For more helpful kitchen organization hacks, see our post.